Yay! I am so excited! 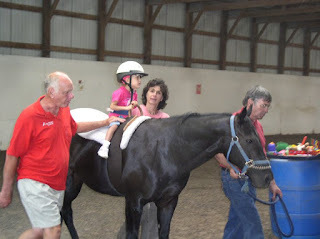 Eden had her very first hippotherapy session on Wednesday. She did an incredible job, and I am so proud of her. 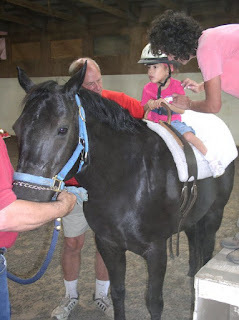 Hippotherapy is basically just physical therapy on a horse. The horses movements mimic the pattern of human walking, and require the rider to use their core muscles for trunk support, while at the same time really stretching those adductor muscles on the inside of the legs. Exactly what Eden needs. Plus, it's really, really fun, making it that much better. I have to admit that I had an emotional moment at the beginning. I can't describe the feeling, except that it was a combination of pride, joy, and absolute panic. I thought that I would be involved in the process. You know, helping get her on the horse, helping hold her while they led the horse...something. But the therapist took her from me, and she went willingly. And that was it. I was supposed to sit on the bench and watch. Gasp. I guess it was separation anxiety that I was feeling, stemming from that relinquishing of control. I have been completely involved in everything that Eden has ever done, especially when it's something big and new. I KNOW what she is thinking and feeling, and I know how to help her manage her body and tone. I know what she needs and it was hard for me to take a step back and let her be independent, separate from me or from her dad. I know I've gotta do it, but it's not going to be easy. That's so awesome. 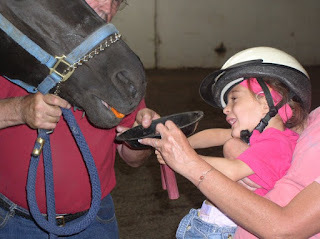 I want to get my daughter 3 & 1/2 into hippotherapy this fall as well. I love your blog. Your a great mom. You have a wonderful family and such beautiful girls! Look at petite little Eden sitting up so straight on that massive horse-- with her helmet and everything! It's a wonderful picture. And you know, it's unusual that any child her age would feel so confident. I wonder if horses will be in her future in a non-formal therapy way. Plus, how fun for her that for once she gets to be up higher than everyone else around her! Miss Eden IS all that!! She looks so proud and at ease....very awesome! y tú? ni modo, a ver de lejos! I actually saw something about this on the reality show "Work Out" of all places. One of the woman in the "SkyLab" program had a daughter who did it. She said the results were incredible. For an hour or more after the therapy, the child could walk almost normally. I hope it means great things for Eden. She looks so good sitting up there on her horse. John starts hippotherapy in Oct. and I cannot wait. This letting go thing is hard...I can already see that and we're two years (at least!) away from preschool still. But it's also great. Eden looks marvelous astride the horse, and I am so proud of her...and of all of you guys. Fantastic news! Go Eden! Yeah Mom & Dad! Yeah Holland (for allowing your sister this moment to shine)! Eden looks so great up on that horse, I'm so glad she did so well. Letting go is hard, isn't it? that looks so cool -- you must be so proud of her. I would love to know how you got her started in this and if it was state funded or not b/c I am very interested in getting Ariana (my daughter) involved. I'm proud of you both! Bravo, Billie! Love it...she is such a grown up girl. WOW! I just discovered your blog while googling something preemie related (I can't remember what now!) and have read the entire thing in just a few days! I too am the mom of preemie twins, Brady and Claire who were born at 33 weeks and three days on March 27 of this year. I also am pumping for them, and have been sitting down to read your blog each time I pump. It actually makes me look forward to doing the dreaded chore! I never thought I would say that. Your family is amazing, and your girls are absolutely beautiful. I am very inspired my what a great mother you are! Go Eden go! We love hippo in our house; it's been great for Hannah. Good luck with school starting for the girls. I'm waiting until mine are 4 as well before I send them off and although it's still a year away, I'm already worried about letting them go. We know how good it is for them but it's still hard. I am a lurker but had to say as strange as it sounds she looks so tiny on that horse and yet so grown up all at the same time! Your girls are beautiful and you and your husband are doing a great job! WOW Mom and Dad it looks as if your "little" girl is growing up! What magic.